Last edited by faaip on Tue Aug 14, 2018 6:00 pm, edited 1 time in total. 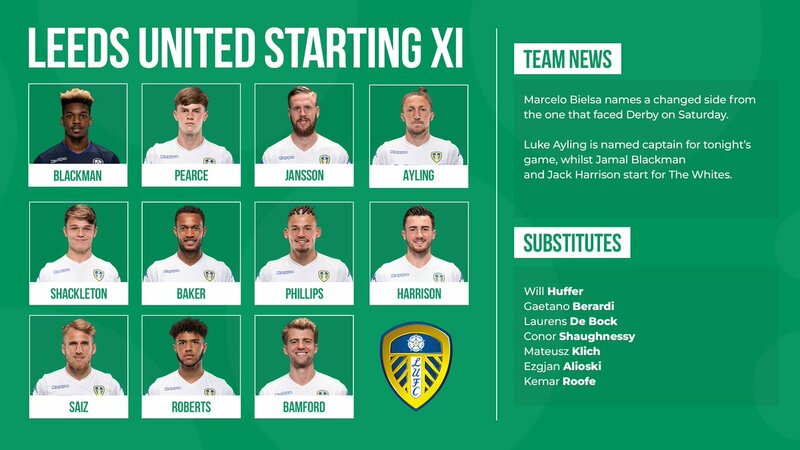 Roofe, Beradi, DeBock, Alioski, Clarke, Edmondson, Reserve keeper not sure which. Is Shaughnessy fit or has he played in any U23 games yet? The first U23 game of the season is tonight. . . . . . . . . . . Blackman . . . . . . . . . .
. . . . . . . . . .Rey. . . . . . . . . .
. . . . . . . . . Bamford . . . . . . I think De Bock would be a very big risk there mate. If Shaughnessy is fit, I would go with same side as Leon apart from putting in the young lad instead of De Bock. Absolutely no need to risk any of the the team that has started the first 2 league games and given the way Bielsa has got them working, they deserve a break before Saturday's home game so they can continue the high octane style of play versus Rotherham. I agree mate, just trying to fit round pegs in square holes mate. Not a De Bock fan one bit. ShockedNessie will play for the u23s tonight AND be in the 18 tomorrow. So whoever plays tonight still could play tomorrow seemingly. I don't recall Phillips name mentioned in the Presser Richard, may have missed it but would be surprised if he is involved tonight, at least starting XI wise anyway.